Hi everyone!! It is the first post after postpartum and I am blessed with a baby boy. The time has literally flown by I was not much troubled by the pregnancy phase. :D I got my Fab Bag some time ago but could not post about it. This time the bag is really cute with the Holographic pattern. I like holographic patterns and this is really in trend this season. 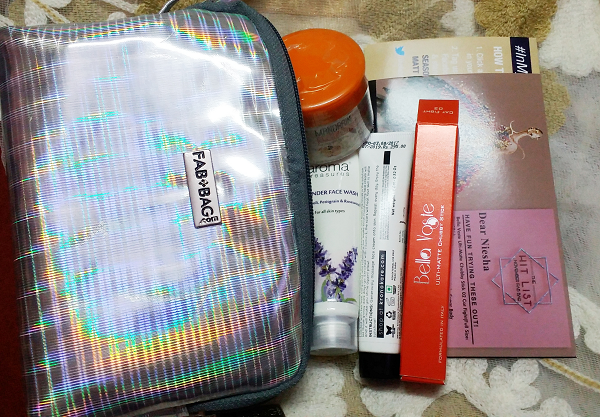 Fab bag has curated this holographic bag with amazing products inside. I received the mail where I was given this mail to choose the lip product of my choice. I chose this shade in the Rose shade which is a lovely red rose color. I loved this chubby stick and the shade is also beautiful. Kronokare is a brand that has been kept in the Fab bag for so many times. It makes so many skin care and hair care ranges. It is a face cream which is moisturizing and can be used for oily skin. Oily skin needs some of the moisturization which is non greasy and non oily. This can be used in the winters as well since the formula is light weight and non greasy. I have tried a lot of Nature’s Co products so far and this is the body scrub which has the orange scent and is basically is a sugar scrub for the body. I like using body scrubs but I hate that oily content in them which leaves the skin oily post shower. This scrub has the citrusy smell which is invigorating and refreshing. Aroma Treasures products are also herbal in nature and are used by the people who like to try the herbal skin and hair care products. This is the one has the lavender smell and has the essence of the lavender in it. It is a face wash which is in the mini sample size. I like to keep these as back up as when you travel or go to some other place or city then these can be a good use and throw thing. I have not tried this brand yet and it is a new brand for me. Let’s see how this fares. So, this month’s bag was a hit for me as I got a full sized crayon which is a beautiful rosey red color. Moreover, the colors is also ideal for the everyday use as I like such colors. 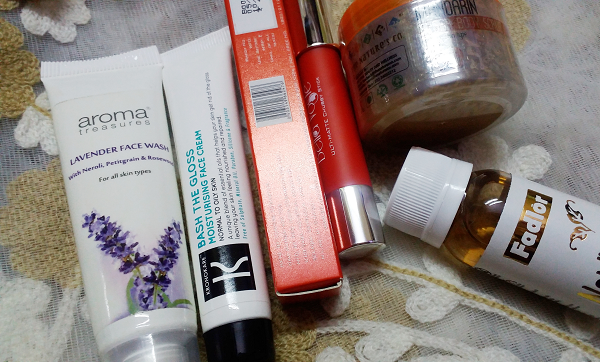 The bag has a mix of skin care, hair care and makeup products so, this is a good bag for me. I will definitely recommend this to you.